While the Music app on your iPhone, iPad, or iPod touch might be sufficient for you, there are plenty of other apps you can use to listen to music on your iOS device. Some offer unique ways of organizing and listening to music, and others focus on providing better sound. Here’s a look at three apps that you can use to listen differently to music on iOS. When you listen to music on an iOS device, it may not be in optimal situations. If you’re on the move, you may listen on mediocre headphones in loud environments (the morning commute, say). If you’re in your office, you may have a small iPod speaker dock. Or you might be listening on some excellent noise-canceling headphones or using audiophile-grade cans. SonicMax Pro lets you adjust a number of settings to get the best sound for your listening device. 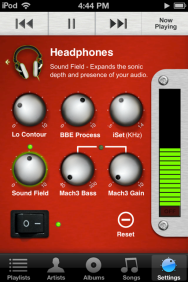 BBE Sound’s $5 SonicMax Pro steps in to tweak your music and provide better sound on your headphones, through speaker docs, or even when your iOS device is connected to good speakers. When you launch the app, you can choose what you’re using to listen to your music: earbuds/earphones, headphones, external speakers, a dock, or a custom device. 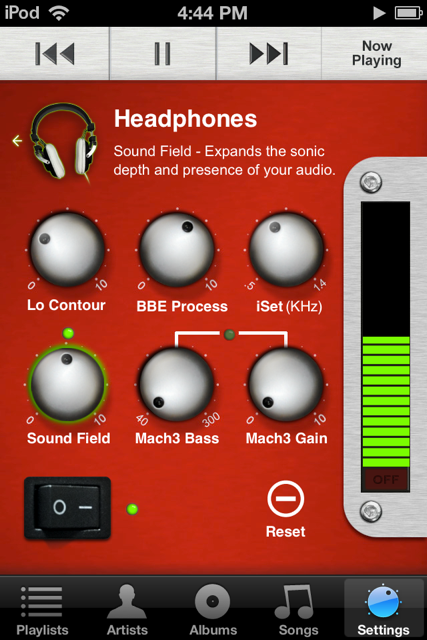 Then, in the app’s Settings screen, you can make a number of adjustments to enhance your sound. BBE calls these Lo Contour, BBE Process, iSet, Sound Field, Mach3 Bass, and Mach3 Gain. One thing this app does is enhance bass, so if you listen to music that calls for more bass, you can compensate for weaknesses in your headphones or speakers. The BBE Process enhances high frequencies, and can sound tinny if set too high. But the Sound Field setting is the most interesting. It is a kind of faux surround sound that renders the soundscape much more detailed. For some music, I found this worked very well; for other types of music, certain highlights sounded slightly artificial. Classical music is probably least suited to this type of sound enhancement, since part of its effect is to position instruments and voices in multiple locations across the soundscape. In other words, an instrument that is in the center of the mix will sound spread out. Rock, punk and reggae all sound much more spacious though, and some jazz sounds better as well. (Bauhaus’s Bela Lugosi’s Dead is a great track to test this app, for example.) I tested with both my portable headphones (Sennheiser PX 100-IIi) and home headphones (Beyerdynamic DT 990), and the results were noticeable on both. On the portable headphones, the increase in bass was welcome, whereas on the Beyerdynamics it wasn’t needed. Once you’ve adjusted your settings, you can choose music by artist, album, genre or playlist, and playing your music is simple. My only gripe is that playlists nested in folders don’t display in folders, but all playlists are listed alphabetically. 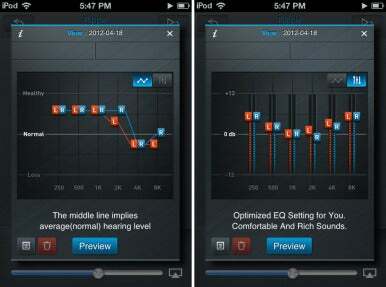 There are many apps that offer equalization features. You can adjust different frequency ranges to compensate for small speakers, earbuds, or poor headphones; or simply because you like your music to have more oomph. But when you fiddle with EQ settings, you have two choices: either pick a preset—often named after a genre or style of music, such as classical, jazz, vocal, or acoustic—or roll your own. The latter is tough to get right, and the former (which you can pick in Settings -> Music on your iOS device) never really sounds quite right to me. My "personal hearing curve" (left) and the EQ that SoundBest applies based on that data (right). Klisten’s $3 SoundBest Player takes a different approach. While it offers standard EQ presets, what sets this app apart is its ability to make a custom EQ setting that matches your hearing. When you launch the app, you spend about 90 seconds taking a hearing test; essentially the same kind of test an ENT or audiologist would give you. The app finds your “personal hearing curve” and creates an EQ setting to compensate for the differences between your hearing and what is normal. This approach is interesting, and it’s hard to say how it sounds—it’s meant to be neutral. It corrects the sound output to match the deficiencies in your hearing. So while it doesn’t make music sound any better, per se, it can make it sound “right.” You can create multiple presets for different headphones or listening devices, and store them, choosing the one you want for each listen. The one problem for me, however, was that it boosted the bass, even though my hearing doesn’t need that boost. You can’t edit the EQ settings it creates for you, so you can’t put the bass back where you think it should be. But you could look at the graph of your hearing and create your own preset, taking into account the differences it highlights. Sometimes when I listen to music on my iPod, I hear a certain song, and that makes me want to hear another song, maybe by the same artist, or something that is similar in rhythm or style. On my Mac, I can use iTunes DJ; I use it a lot to queue up music for my daily listening. But I hate the iPod’s On-The-Go playlist; it’s too complicated to be practical. And iOS’s Genius Playlists feature doesn’t provide enough flexibility. Former Macworld contributor Daniel Pourhadi’s $3 OnCue is a great tool for creating and updating a permanent queue of music that functions like iTunes DJ. 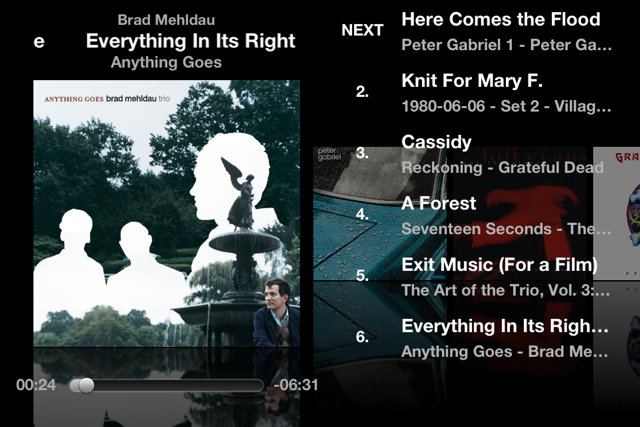 OnCue in landscape mode, showing the current track, and the upcoming tracks in my queue. OnCue lets you create dynamic playlists—or queues—adding music as you listen, dragging songs around, and manipulating your music so you can cue up the next three songs or the next three hours of listening. You can swipe to see what’s next in the queue, and change the order of upcoming songs at any time. You can navigate to find songs, or browse by album, artist, genre, song, and more. OnCue picks up the playlists you sync from iTunes, and you can save your own in the app. You can make smart queues—similar to smart playlists—and if you swipe a track you get can info about it, such as lyrics, and artist bios. It even displays the current track and the next four in the queue on your lock screen so you can see what’s next. OnCue has a lot of features, and can be a bit confusing to get the hang of. But the core feature—the ability to create a listening queue and easily add more music to it—makes it a great tool if you like to choose your playlists on the fly.